Wedding bells have rung for actress Asin Thottumkal. 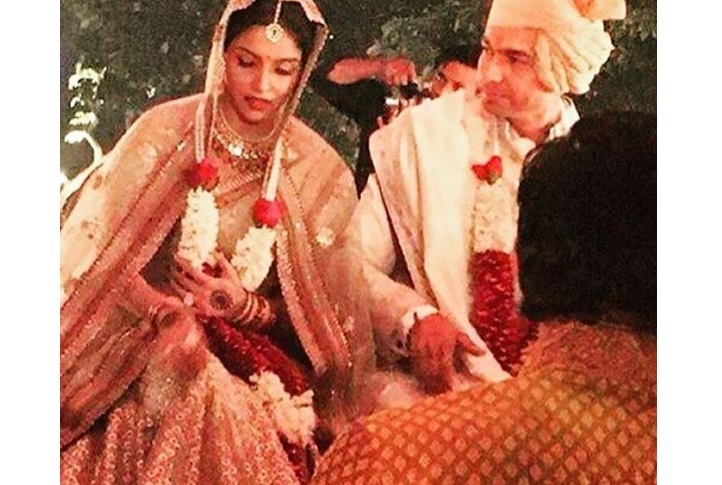 The actress got married to Micromax founder Rahul Sharma yesterday in New Dehli. Since Asin wished to have a Catholic style wedding, a Christian wedding ceremony was held, followed by a ceremony by Hindu rituals. According to reports in a leading portal, the event took place at Hotel Dusit Devarana on NH8 NCR where the lovely couple tied the knot. The event was restricted to relatives and close friends only. However, a get together has been arranged at Rahul's farm house and the couple is also looking forward to host a reception in Mumbai. The marriage ceremony took place under tight security to maintain maximum privacy. Asin looked beautiful, dressed in bridal wear by acclaimed designer Sabyasachi Mukherjee. What's interesting is, Akshay Kumar was the first person to receive the wedding card as he was the one to play Cupid between the two. Asin also kept posting pictures of her wedding card on her Instagram profile. Earlier, there were reports about Rahul and Asin dating each other and also that the couple was looking forward to marry soon. Finally, the couple has steped into the new phase in their live and we wish them well!